52 • RV PRO • September 2018 rv-pro.com R V M A N U F A C T U R E R S they can take kayaks or bikes or four-wheelers on, more like an all-terrain type of vehicle," he adds. Included in the changes are the back of the coach, for more storage, full cases roof racks and more aggressive, off-road type tires as an option. "It will go across the board in terms of attraction to demo- graphics – from people who just wat to get out there to take pictures to people who really want to get into the wilderness," Stephenson says. Also, in the offing are new options and standard features for coaches, such things as lithium batteries as an upgrade and a new standard upgrade to a new wireless digital control panel. "Some people are uncomfortable with a lot of tech, but this will be the best system in the industry. It's intuitive so it is going to be easy to work," Stephenson adds. Midwest also will be introducing plans for a new Ford Transit Class B and getting input from dealers and consumers on a new model that will be unveiled in the summer of 2019. "It will be brand new and will be giving dealers a new offering," Stephenson says. "We will be getting input at the open house to the type of model's dealers want to see and moving forward from that point. It will be brand new and we have never built on a Ford chassis before. While Mercedes builds a good chassis, there are a lot of guys who want the Ford or Dodge chassis." For Elkhart Open House Week, competition will again be fierce. Midwest is undaunted. "Our product is our draw," Stephenson says. "We build the nicest Class B in the industry with a wide variety of options and different price levels. We are literally a one-stop shop for people looking to get onto the B van or those who want to focus on just one brand." A dozen of those Class B's will be on display and Midwest will be open every day from 9 a.m. to 5 p.m. with catered lunch. As to the outlook for 2019, Stephenson sees good things ahead. "We expect to do 40 percent sales growth again, for sure," he says. "We have enough backlog and plan on being in another factory by the end of the year to put our people in and to be able to pick up that growth next year. Obviously, the market is hot right now. Industrywide, it's up this year. I think we are outperforming the industry and we look to continue to do that." Customers, he adds, "want a lot of choice and they want to have the RV the way they want it, not necessarily the way everybody builds them. We want to offer customers the ability to add and subtract from their floorplans to make things the way they want it." LANCE CAMPER Lance Camper has been one of the few West Coast-based manufacturers to exhibit during Open House over the past five years. 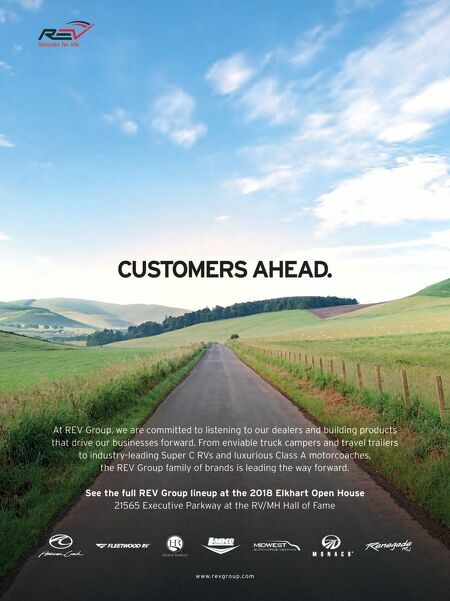 This year, Lance will gain some elbow room among the bigger names in the industry, as the builder of truck campers and lightweight travel trailers joins the crowd near the RV/MH Hall of Fame in the display of its new parent company REV Group. REV acquired Lance in January. "It's been nothing but a positive experience for us," says Bob Rogers, Lance's director of marketing. "We've been able to take advantage of some of their benefits due to sizing, primarily in the pricing side of things from suppliers. We buy X-number of A/ Cs a year; they buy many more than that. So, when we go together, we've realized some cost reduction for parts. From a marketing standpoint, we'll be in their display at key shows, so we will have a much bigger presence overall while still being able to retain our brand identity within that." To kick off its first industry show under REV, Lance will be introducing its largest travel trailer – the 2465. Rogers says the total length is still to be determined, but the 2465 will have a number of features that set it apart from other Lance trailers. The 2465 will be Lance's first dual-slide model. It will feature a standard king-size bed in the master suite and an optional 40-inch LED TV on an electronic riser that comes out of a cabinet in the bedroom. The double-axle trailer also will have flush-floor slides and a disc brake option. 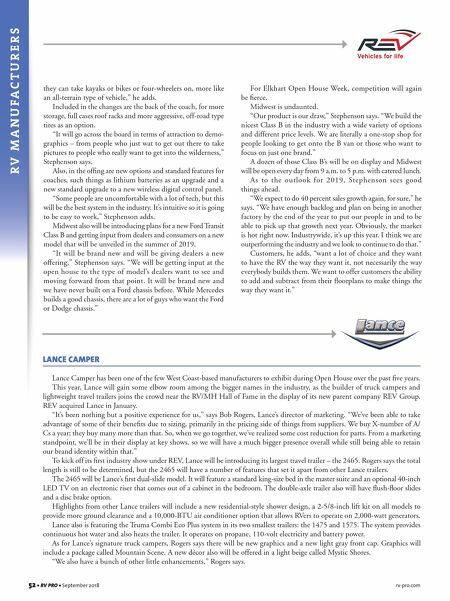 Highlights from other Lance trailers will include a new residential-style shower design, a 2-5/8-inch lift kit on all models to provide more ground clearance and a 10,000-BTU air conditioner option that allows RVers to operate on 2,000-watt generators. Lance also is featuring the Truma Combi Eco Plus system in its two smallest trailers: the 1475 and 1575. The system provides continuous hot water and also heats the trailer. It operates on propane, 110-volt electricity and battery power. As for Lance's signature truck campers, Rogers says there will be new graphics and a new light gray front cap. Graphics will include a package called Mountain Scene. A new décor also will be offered in a light beige called Mystic Shores. "We also have a bunch of other little enhancements," Rogers says.